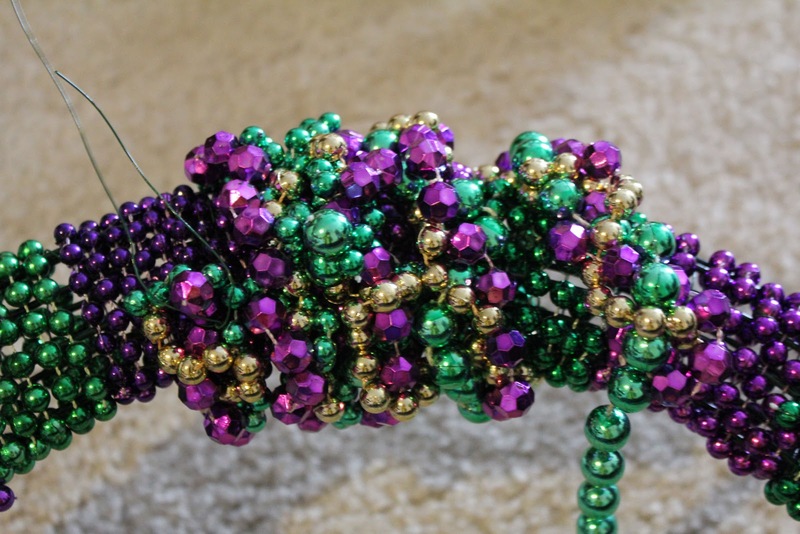 This is a project that I dreamed up after last year's Mardi Gras parades here in Louisiana. We collect so many beads and had such a great time with friends, but I had no idea what to do with the beads once I got them home! I just couldn't throw them away, so I made a wreath out of them. In the past year, I've made or taught someone else how to make this wreath 5 times and the craft club that I coordinate will be making them in 2 weeks. So many people like the idea and ask me how to make it and it's time to make a tutorial to share with the world. 2. A bow ---> I've made several different types so choose a type that makes you happy. 1. 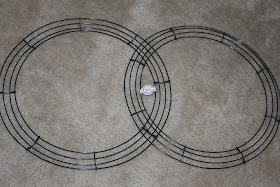 Place the wreath frames together facing opposite directions. 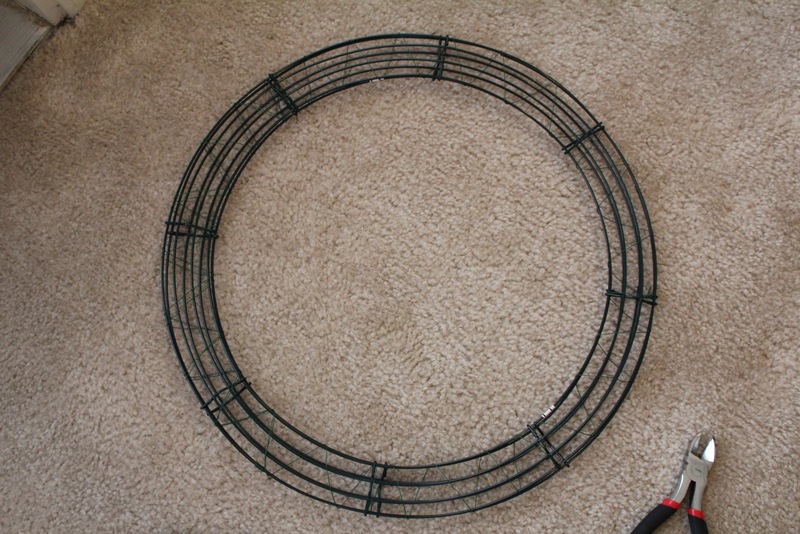 This helps to make the wreath look more full without getting to heavy. 2. 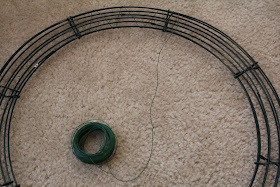 Wrap the wreath frames with green floral wire so they won't shift. Twist the floral wire to tie it down. 3. Cut each strand of beads so that they are no longer in a circle. 4. 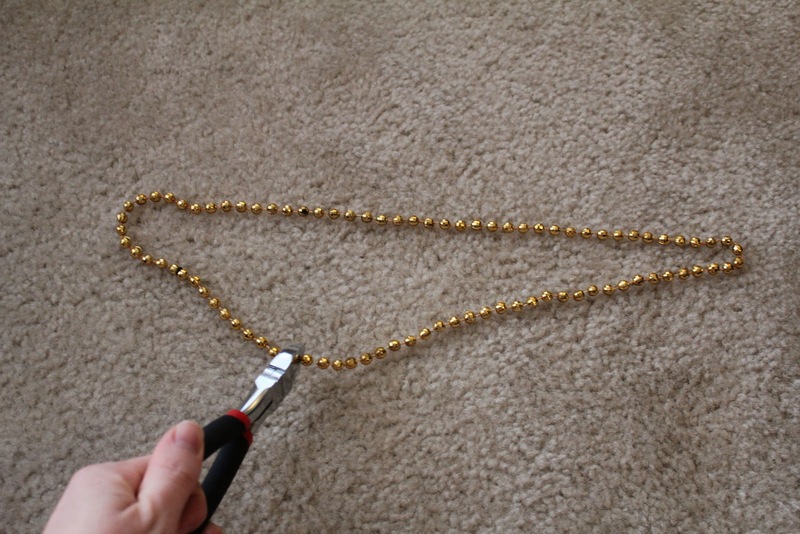 Feed one strand of beads in between the frame and twist the end of the strand around the necklace to lock it in place. 6. Once you've wrapped the frame, use a 6 inch piece of floral wire to twist down the end of the strand of beads. Leave the ends of the wire out for later. 7. 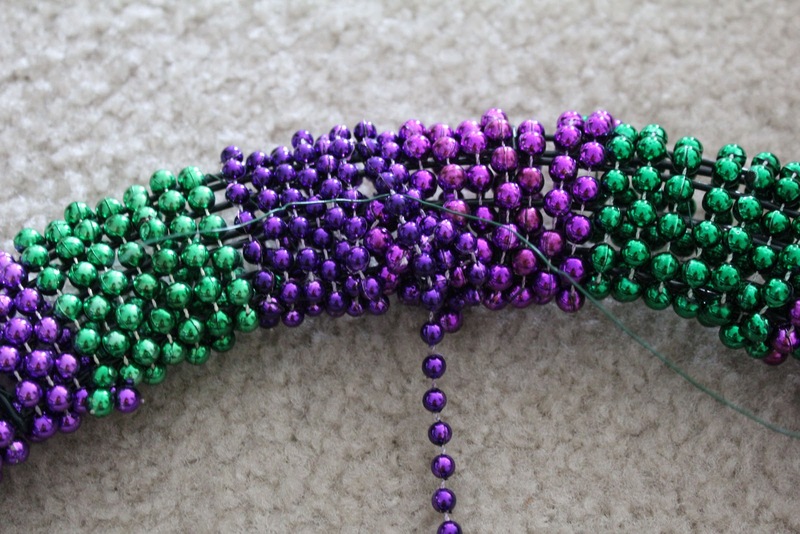 Twist a gold, green and purple strand of beads together. You're locking them in place so that you can start braiding them. 8. 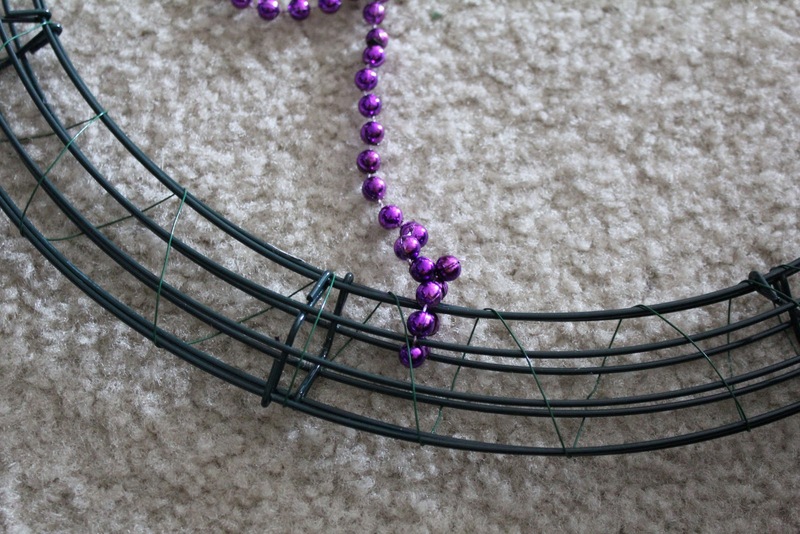 Using the remaining wire, twist the 3 bead strands down to the wreath. 9. Braid, braid, braid.... 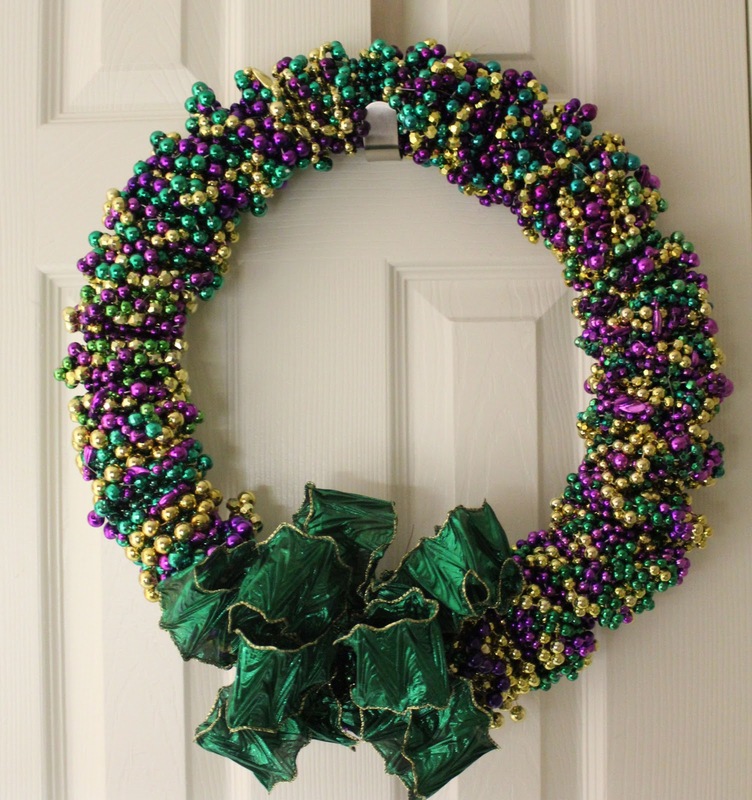 Always make sure you have a strand of each color so that the 3 colors will be evenly shown throughout the wreath. 10. Wrap the braided beads around the wreath. At this point, I use a 6 inch piece of floral wire and secure the end of the braided section to the wreath frame. Then, snap on a new strand of beads and keep braiding! Add your bow (and a Mardi Gras ornament if you have one) and you're finished! It really is that simple and beautiful. So cool! I wish we were stationed close by so you could teach me some craft skills! I love this one! It's gorgeous, really! :D And the colours you chose are just beautiful too! Oh wow! 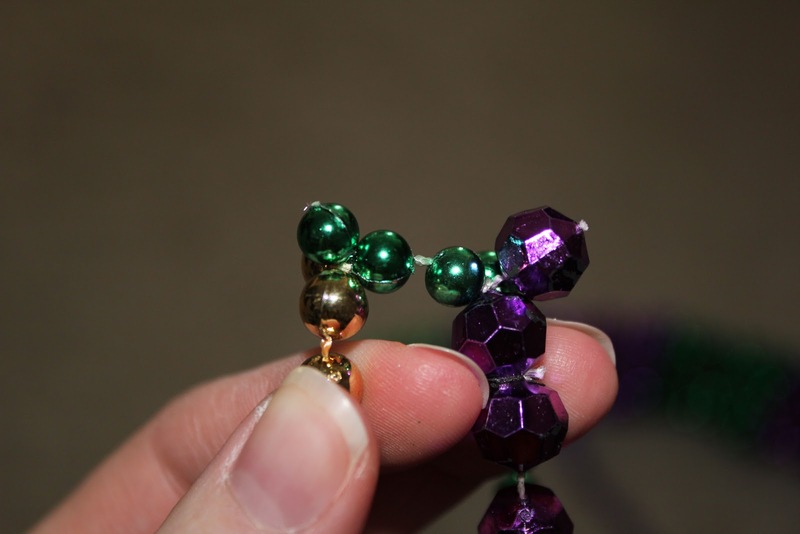 I've never seen mardi gras beads used like that! You are such a creative person! I'll have to go down and get some supplies so that I can make my own wreath! Darn! I should have saved those mardi gras beads I got years ago! What a fabulous tutorial. Okay to feature and link in a future post so others can come visit? 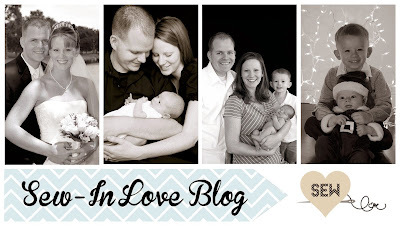 I love for you to share my post! Just saw this on pinterest! Great idea. Making one for my daughter at Tulane for her dorm room. Thanks for sharing! Thanks for sharing this idea. 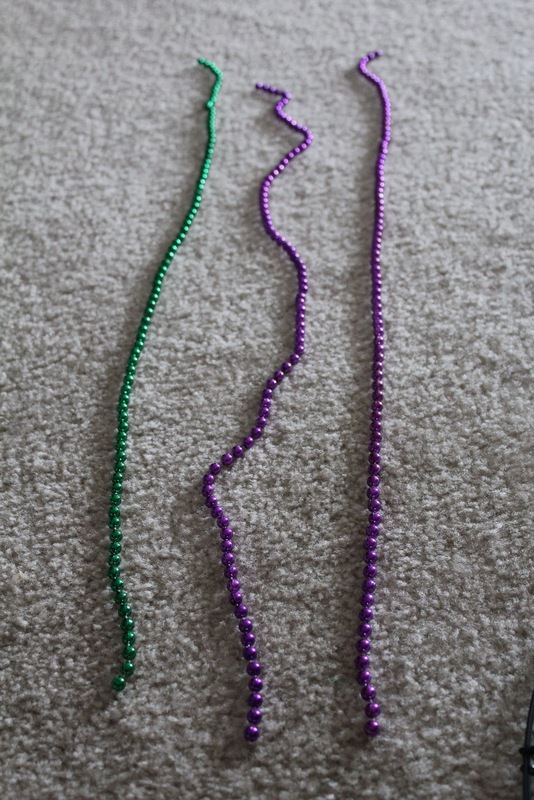 I still have a ton of beads left from the parades we attended when we were stationed at Barksdale. (The parades and celebrations are probably what I miss the most.) Thanks for the idea! My friend and I love the idea... It took us two and a half hours to do it but love every minute of it!!! Thank you for the ides! I love it! And so easy! I made a colorful version of this because I didn't have enough purple, green, and gold. Thanks for the idea and tutorial! :) -From Lake Charles. OMG! This is great! Can't wait to try it! After seeing this pin, I also had tons of beads to use. I have a little more simpler way tho to do it.. I dont do the wire wreath or all that wiring.. Its just not me.. I bought an inexpensive foam ring from craft store (with a 40%off coupon), and a refill bag of glue sticks for the ole glue gun... started with a strand of beads, glued one bead, and just wrapped around the foam ring, tacking ever so often with glue gun. Added a bow, and WALA.... sooooo easy.. I am just not into wiring. But the Wreath is Gorgeous, and I apreciate the idea!! OMGosh! This is FABU!!! 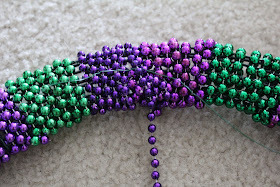 I'm bookmarking this project and your blog then dashing out to buy beads because I don't live in LA!!! R U OK with me pinning your tutorial on the HERE DIY Projects Board? Mcatherine- That would be great! Thank you for the wonderful tutorial! Just got back from mardi gras in LA with a whopping 15+ lbs of beads, and had no idea what to do with them. This was perfect! I contemplated foam vs wire, but figured wire might hold up a bit better with the weight of the beads. 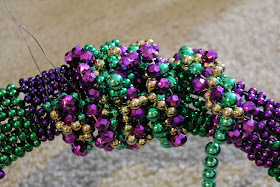 I have a "few" (almost 15 pounds) of beads from a wonderful visit to N'awlins for Mardi Gras. 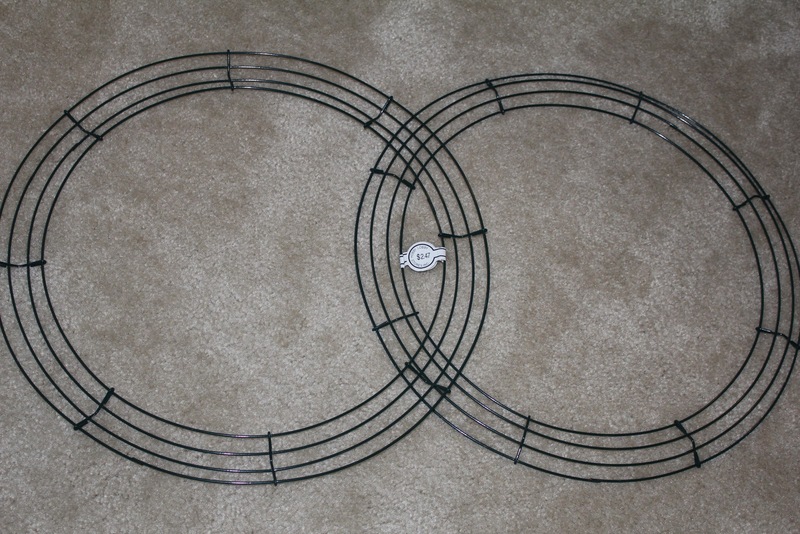 I am so glad I found this I am going to make this wreath. Mine will incorporate all the beads that I caught which are soooo colorful. 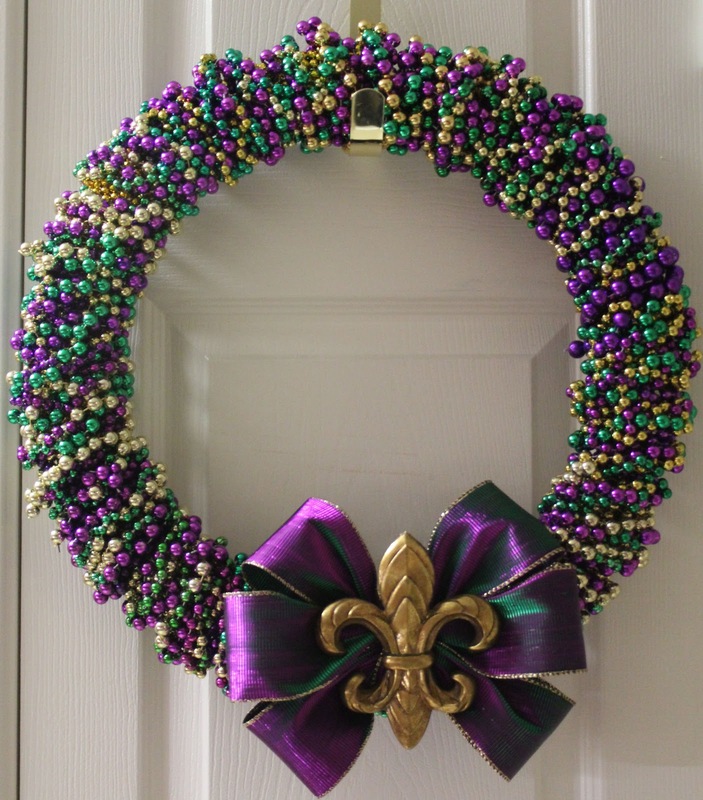 Thanks for posting, this wreath will mean alot cause of the circumstance of my visit to the Great state of LA. 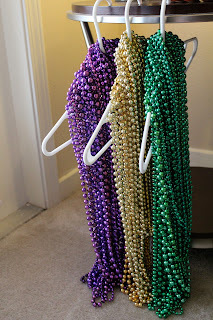 This is far and away the best use of Mardi Gras beads. I just love it! Thanks for sharing your method! What length beads? 33" 36" ? 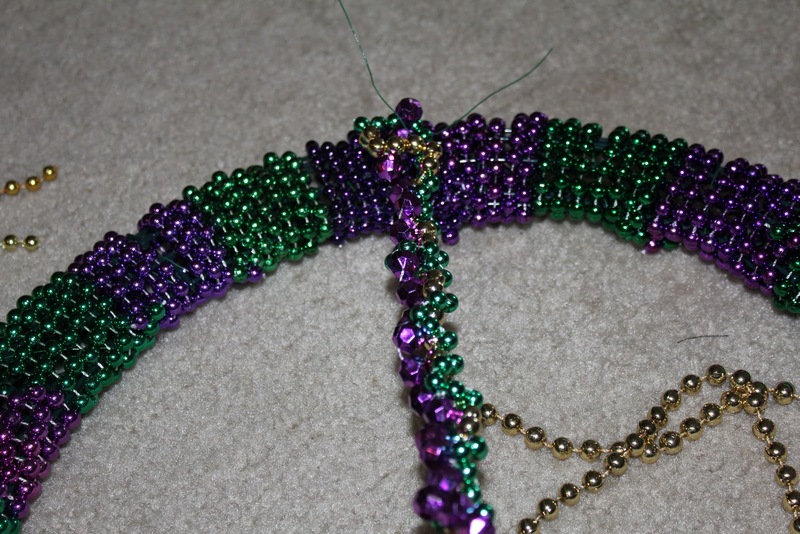 MCatherine- I did not measure the lengths of the beads... I had all different sizes so I just sorted them by color. I USED A STRAW WREATH AND NEEDED A TON OF BEADS...THE WREATH IS SO HEAVY!! i LAUGHED AT MYSELF AND NOW I'M OFF TO THE STORE FOR THE WIRE WREATH YOU RECOMMENDED!! OMG! 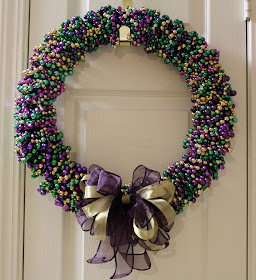 What a brilliant use for old Mardi Gras beads. I liked yours so much that I made one per your tutorial and it turned out incredible! It was so easy. Absolutely love it! Many, many thanks for sharing your FANTASTIC idea. The beads fade in the sun. How do you prevent that, or do you just advise not to hang the wreath on the door outside. If your wreath is displayed in the sun, it will fade. I've displayed mine inside and outside without it fading, but our door is shaded most of the day. I am excited about making this wreath, but having difficulty keeping the first layer of beads in place. What is the secret? Thanks for writing! 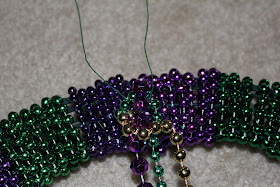 I looped the necklace through the wire wreath, twisted the beads together to attach them. You can also wrap the first beads to the frame with floral wire. Good luck! Hi! 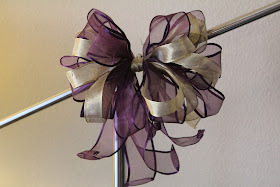 I really love the bow with the fleur de lis and have been trying to find some ribbon like that but haven't had any luck. Can you tell me where you found it? I purchased the ribbon from Hobby Lobby! 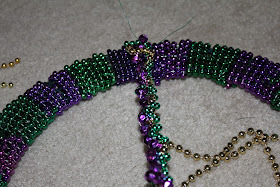 I love this idea, but have had a heck of a time trying to get the ends of the bead strands to stay put. Any suggestions? 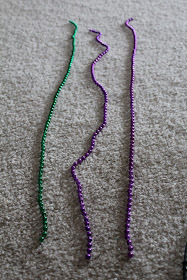 As I was working, I would just twist the necklaces together until they lock and then keep braiding the wrapping. Then, at the ever end, I used the floral wire to twist the ends down to the wreath. 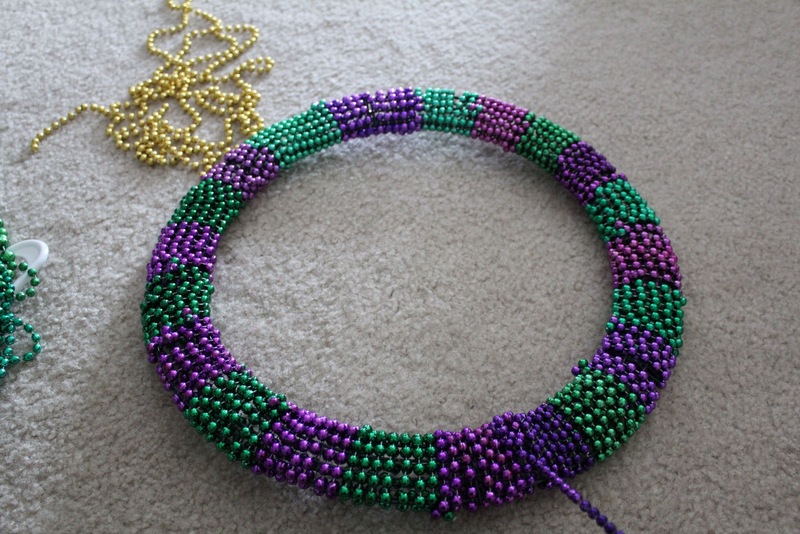 Sooooo about 75 strands of beads should be enough to completely do this?? Does that 75 count in what you used to "cover" the form? I'm just hoping I have enough (25 ea color) to complete a wreath....don't want to start and then realize its not enough! Thanks! THIS IS SO CUTE!!! 75 is the total number of beads you'll need for covering the wreath form and wrapping the entire wreath.